Businessman and father of four, Rick Van Warner, has always wanted the best for his son, Tommy, who has been addicted to opioids since the age of 16. Van Warner talks about his son's first trip to rehab, and his brokenness and sorrow over his actions once he got out. But Tommy was hooked, and his behavior escalated. Manipulation, lying and relapses have been common over the course of Tommy's 10-year addiction. It's a "cycle of madness" for the Van Warner family, but Rick continues to hold on to hope. Bob: Why are so many people in our culture today addicted to opioids? That’s a question Rick Van Warner began to explore when his son started abusing drugs. When you put that together with the fact that there’s a very inextricable link between opioid addiction and, in most cases, mental health as well—in our son’s case, he’s got mild depression and been diagnosed with social anxiety. You put those two together, and the drugs are an escape from pain. It’s a drug of isolation—it’s not a drug they do with their friends to go to a concert—it’s a drug that they do alone and then withdraw to a dark room. You know, what I mean? It’s a drug of withdrawing from whatever psychological pain someone is facing. Bob: This is FamilyLife Today for Tuesday, October 2nd. Our host is Dennis Rainey, and I'm Bob Lepine. What often looks like an escape from pain to an addict is really a pathway to destruction, as we’ll learn more about today. Stay with us. And welcome to FamilyLife Today. Thanks for joining us. You know, when a family goes through a desperate season, like the one we’re hearing about this week—I think a lot of us—our impulse is to want to hide this away and not let anybody know what we’re experiencing, because there’s shame tied to this. Dennis: —that they can turn to for encouragement, help, hope, and prayer—and just a hug, occasionally. Dennis: We have the author of a new book called On Pills and Needles. Rick Van Warner joins us again on FamilyLife Today. Rick, welcome back. Dennis: Rick tells the story, in this book, of his son, Tommy, who, for no apparent reason, just completely ended up being missing for four days—finally found him in a corner of an abandoned building on the fourth or fifth day, and took him away to a rehab unit, and began the process of realizing they had a son, who had been addicted, at the age of 16, to narcotics. Rick, you began to explain in your book how that was just the beginning of the story. How long was he in the rehab unit? Rick: Well, the first one was only a few days—it was only about a week before he was asked to leave that one; because he wasn’t interested in being clean; he wasn’t interested in complying with the rules. He had been convinced by some older people in the clinic to sneak out and buy them some cigarettes at a nearby convenience store in the middle of the night. He got caught and was asked to leave that facility. I think that, when we first found him and got him into that first detox facility, at that point, we had that hope that he would get it; and that this would—we couldn’t have even fathomed, at that point, that this would go on, now, for another decade, and that he would go through 14 relapses; that he would be, twice, resuscitated from death by overdose; that he would end up in jail on a couple of occasions for possession of drugs; that he would be homeless when we realized that we could no longer have him in our house, at certain points. The tragedy and the journey has been long and treacherous; but I think you touched on something very important, which is the stigma that exists, particularly with opioids, which most people think of as heroin. Again, pill-form heroin is OxyContin and similar drugs. Because of that stigma that exists, a lot of people do keep that within the house. They try to hide this, as well as other family problems; because there are a lot of other problems that parents and families go through, and they try to withdraw and keep it in the house. Honestly, that’s about the worst thing you can do; because the more you share, the more you realize that other families are going through very similar struggles. If it’s not drug addiction, it could be other addictions / it could be other problems. When you took Tommy to rehab—I mean, he was stoned when you picked him up; right? He was still under the influence. Rick: He was always sorry/always thankful; you know, his lovingness and his nature was there. These drugs rewire the brain chemistry in such a way that it takes almost a year of sobriety or more to start to repair and get those wirings back in order. It’s tough for them, in that period, to understand the implications of their actions and of what they’re doing to the others around them. I think that the more I’ve read research on this—on what opioids do to the brain—and the more research that has been done—frankly, you know, there’s more research going on every day. If you consider that the brain is the last frontier of medical science, there’s still so much that we don’t know about how this works. But I have come to understand that he cannot even begin to fathom what the impact is; because his brain is still in the place where he’s got that craving, constantly, to relapse. Rick: Even as far as when you’re sober for a year. Rick: He had a full year of sobriety before he lost an old girlfriend to an overdose, and that set him off the deep end. That physical yearning for that drug—once it’s hijacked the brain once—it remains for a long, long time. Dennis: I think a lot of people don’t realize that these rehab units really are effective in helping a young person—or for that matter, an older person as well—to deal with their issues and to come, face to face, with the kind of calamity they’re causing. 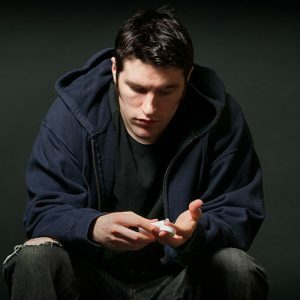 What most of us don’t realize is that 80 percent of those who go through a rehab program end up relapsing. “Relapse is part of recovery.” If you really look at the nature of the rehab programs, the success rates on alcoholics is said to be 15-20 percent—can stay clean for a year. With drug addicts, it’s 8-10 percent. And, supposedly, with opioid addicts—and there is no hard, fast evidence on this—it’s probably less than 5 percent. It’s a different animal, if you will, than even alcohol. There are a lot of good rehabs out there that do their best, and there are some that are effective. It’s really up to the person, though—it’s person by person. And there are quite a few rehabs we’ve run across, where they’re clearly in it for the business. Dennis: Talk for a moment about the behavior of a person, who’s an addict. One of the ways I’ve heard them described is “…a liar, a deceiver, a manipulator”—always trying to figure out a way around any boundary that’s put in their place. They’re absolute, pathological liars. When somebody is in the grips of opioid addiction, there isn’t a word that they can say that you can trust. Dennis: And the interesting thing is—a parent has a heart full of love and hope for their child. Dennis: So he or she is set up to believe the best about their son or daughter. The reality is—that addict knows how to use that to his advantage. Rick: Inherently, they know how to manipulate and deceive—stealing from all of us. I mean, he stole from all of us in the family. Bob: Well, you had an encounter with Tommy and a therapist, where you were believing your son and she wasn’t; right? Rick: Yes; we had one meeting with a therapist, a while back, who felt that he was just snowing us. My wife and I were both there; he challenged us to drug test him on the spot. I left the therapy office—and my wife was still there with him—and went down to the Walgreens, and got a drug test kit. Sure enough, she was correct! Dennis: —in the midst of it? Rick: —in the midst of it! Dennis: What can’t be described is the amount of chaos. Dennis: It completely causes the family to be in a constant swirl. Rick: It is complete chaos in the house. You know, it creates dysfunction. You’ve got three other children that you’re trying to raise—and are in the middle of it—and exposed to things they shouldn’t be exposed to. There’s the bickering and the divide it puts between the spouses. It is just difficult. It was just—it’s like living in a cycle of madness—is what I’ve described it as, in a sense. It’s a miracle that our marriage survived, and we’ve come through it; but we’re both strong, and we never lost our faith. We continued to do what was best. I think it would have been a lot harder if we didn’t have three other children, because we knew we had to do right by the three other children. That kept us in a normal life as much as possible; but there was always that issue of the addiction in our middle son, which kind of took all of the air out of the room. Rick: Well, we had friends that we were willing to share with. Again, the worst thing is to carry this burden alone. When we started going to Nar-Anon meetings—Narcotics Anonymous for families with addiction in them—we started realizing we didn’t feel so alone anymore. All of a sudden, the rooms were full—and bigger and bigger—with more and more people going through the same things. As time went by, we found ourselves in the role of counselors; because we were so much more experienced with it, at this point, than others. Bob: I mean, you don’t want to even talk about this. Every time it comes up, you just want to go home and hide. Rick: —to have somebody that knew all the pain and the despair we were in the midst of—and how we’re in this life-and-death struggle with trying to keep our son afloat. You know, having that support—and I had a men’s small group that I would go to on a weekly basis as well. All of those interactions, collectively, were tremendously helpful to get through this. Dennis: It’s interesting—in the midst of all this, you never stop being a parent. Dennis: You’re still trying to help your child—trying to figure out how to do that. You opened the door, just a moment ago, for a crack; and then you kind of shut it. You said you and your wife switched roles. Dennis: One parent can be an enabler, rescuing the child over and over again; the other parent can be solid and say, “No; this is not the right thing.” You’re at odds with each other in the midst of that; right? Rick: Absolutely; and it was very interesting, to me, how we would switch roles. I mean, again, it wasn’t contrived like a “good cop/bad cop.” There wasn’t some script or some drama around it, but it did come out that way. “Oh, no!”—you know, my wife would be in the loving spot. But then, we would flip—six months might go by—and the next time, she’d be done with him; and I would say: “No; no! You don’t understand.” I think that yin and yang between the two of us is what allowed the family to survive—and what really allowed our son to survive—because the longer that time went by, the more I understood this concept of enabling. I suspect, other types of narcotics that rewire the brain as well. Bob: Explain why they don’t apply. When you put that together with the fact that there’s a very inextricable link between opioid addiction and, in most cases, mental health as well—in our son’s case, he’s got mild depression and been diagnosed with social anxiety. You put those two together, and the drugs are an escape from pain. It’s a drug of isolation—it’s not a drug they do with their friends to go to a concert—it’s a drug that they do alone and then withdraw to a dark room. You know, it’s a drug of withdrawing from whatever psychological pain someone is facing. If you stop there for a minute, what are we doing by just pushing them into the next rehab? We’re kicking the can down the road; and we’re making the person—that we’re throwing into the next facility—even more isolated and feeling even more of a failure than they already are. Bob: Rick, this was not your first encounter with an addict; because your brother had been a substance abuser; right? Rick: That’s right. My brother fell into cocaine, although that was when he was in his 20s; and I didn’t live with him. We didn’t live in the same state, even. Rick: So I didn’t really witness it much, but he did fall into cocaine abuse. He got clean and sober at 24, I think it was—and is clean and sober to this day. Rick: We did. We sent him up there for a couple of different occasions, where my brother was generous enough to open his home to him. Having been down that road—and “90 meetings in 90 days”—and showed him that you can have a sober life, and still have fun, and these sorts of things—that is tougher to get through when my son was, say, 19 or 20. But again, I think that—back to the tough love concept—I think the point is—you’re further isolating somebody when you’re kicking them out, and when you’re putting them out on the street, or you’re putting them into a rehab program. Certainly, underage, we were able to do that—he didn’t have to stay once he was 18. But, when you look at those approaches versus the approach that worked better for us in the end—which was, essentially, detoxing and giving him the family’s love and support at home—worked out a lot better. He would recover quicker, and he would stay sober longer. Dennis: Rick, you mentioned, at the beginning of the broadcast—and I almost gasped when you said it—that this journey, in and out of rehab facilities, lasted a decade—ten years! Comment, if you would, on the subculture of relapsing addicts, who go in and out of these rehab units. It really is like the passage of Scripture that warns us, “Bad company corrupts good morals.” It’s like your child—even though he or she may be an adult or an emerging adult—is going to be around other people, battling the same addiction. Rick: Right; and it’s not just the company they keep—although it’s worse if you’re at a social system rehab—then, there are people that are ordered there by the law. They have to be there, and they have no interest in staying clean. There are certainly people, who want to stay clean in rehabs, and those who don’t. I think the bigger thing is—you’re not going to cure somebody, who has a chronic brain disease like addiction from opioids, by just putting them in a program that teaches them how to look at the world differently in 30, 60, to 90 days. It just doesn’t really—it’s an overly simplistic approach to a very complex problem. There’s a reason that the success rates for opioid addicts in rehab is so low. Again, there are rehab facilities that are in it for the business. Bob: Okay; so we’ve got to talk about this; because there are folks, who are listening, who are right in the throes of this. Are you saying, “That’s the solution that we’ve got to toughen up and go to”? So you start to say, “There has got to be a deeper problem here.” That’s when I really got into the understanding that this is—you know, addiction is not only a substance problem—it’s also a deep psychological and brain problem. Dennis: And it’s also a heart issue of the child too. Dennis: Spiritually speaking, talk about where Tommy was during this decade. Rick: Well, he’s spiritually connected with nature; but he has never connected with Christ. Bob: So, if I had met him at 15, he would not have said he was a Christian at that point? Rick: Well, he would have at that point; but I think that he’s become disillusioned with organized religion, basically. Rick: He meditates; and he has a belief in a sense of spiritual connection with the world—not so much with a particular doctrine. Dennis: Did you get him in the Bible at all? Could you get him to read the Scriptures? Rick: Not really. He’s never really gone down that road. Rick: Even today. He’s read some things, but he just—that’s part of the problem. Bob: He’s still on a journey too. Rick: He is; he is. And I tell him, all of the time, that, you know: “He wouldn’t be alive if God didn’t have a plan for him,”—as many times as he’s been on the brink of death from this addiction. Parents, like Rick and Maria, who go through this over a decade—they are going to need some strong believers standing with them in the midst of this. Just because a young man doesn’t respond does not mean he’s hopeless! God is fully capable of getting this young man’s attention. Dennis: And He’s also capable of getting your child’s attention as well. You just hope that it will occur sooner rather than later. But in the midst of this—you know, I’m just thinking of you, Rick and Maria—ten years is a long time. Rick: It is, but he’s better today than he was then. Bob: I know you would tell people, who are in this situation—that you need to have other people around you. You need to be hearing the stories of others, who have been through this or are going through it, so you don’t feel isolated / you don’t feel alone. That’s one of the things I think is so helpful about your book, because it takes people into your story. I think families that are dealing with this are going to benefit from just hearing how another family has gone through a very difficult season of time. If that’s your family, or if you know someone—you’d like to get a copy of this book and pass it on to them—go to FamilyLifeToday.com. You can order the book from us online. Again, our website is FamilyLifeToday.com. You can also order by calling 1-800-FL-TODAY. The title of the book, again, is On Pills and Needles: The Relentless Fight to Save My Son from Opioid Addiction by Rick Van Warner. You know, I think of the number of families that are struggling with situations like this—whether it’s opioid addiction or other kinds of drug addiction / alcohol addition—things that happen in families that often leave us isolated from other people. One of the reasons we wanted to talk about this on FamilyLife Today is because we’re committed to providing practical biblical help and hope for the issues facing marriages and families in our culture today. Those of you who support this ministry—you are helping hundreds of thousands of people, every day, by making this program possible to be heard on local radio stations, on the internet, through our mobile app. And now, you can tell Alexa to “Play FamilyLife Today.” Build that skill into your Alexa app; and anytime you want to hear today’s program, just ask Alexa to play it for you. If you need help setting that up, go to FamilyLifeToday.com; and we’ve got information available there that can help you. —we’ve got lots of togetherness tips. We’ll just keep Scriptures and ideas for building togetherness in front of you, all year long. Ask for your copy of the calendar when you make a donation today. And I hope you’ll be back with us again tomorrow when we’re going to talk about what families need to keep in mind if they’re on a journey like the one the Van Warners have been on, with someone in the family addicted to opioids. We’ll talk about that tomorrow. I hope you can join us.